Most of the U.S. Navy’s aircraft based in Virginia and Maryland that are able to fly will be sortied to escape Hurricane Florence, service officials told USNI News. All flyable aircraft from Naval Air Station Oceana and Norfolk Naval Station Chambers Field in Virginia are scheduled to leave today and tomorrow, a Naval Air Force Atlantic spokesman told USNI News on Tuesday. Seventy-five F/A-18 fighters from Oceana will depart this week – a dozen today and 63 on Wednesday – for Army and Air Forces bases in Kentucky, Florida and Illinois. The Navy has also dispatched 36 helicopters from Chambers Field to military bases further inland and to ships at sea. Additionally, E-2C Hawkeyes, E-2D Advanced Hawkeyes and C-2A Greyhounds with the Airborne Command and Control Logistics Wing at Chambers Field are being sent to Wright Patterson Air Force Base and Rickenbacker Air National Guard Base in Ohio. The Test and Evaluation Squadron (VX-1) from Naval Air Station Patuxent River, Md., is relocating to Yeager Field, W.V. On Monday, about 30 ships assigned to Naval Station Norfolk sortied to sea to avoid the storm, and those in maintenance were secured to ride out the storm. Amphibious warship USS Kearsarge (LHD-3) pulled into Norfolk to take on supplies and helicopters in anticipation of military support to civilian authorities as part of any Hurricane Florence recovery efforts, USNI News understands. The Coast Guard has also sortied East Coast ships and aircraft ahead of Florence’s anticipated landfall. In the last two days, the Coast Guard has sortied four helicopters, five HC-130s and 28 cutters to avoid Florence, a Coast Guard Atlantic Area spokesman told USNI News. The path of the storm is set to make landfall in the Carolinas on Thursday. “Forecasts generally project the storm to make landfall between northern South Carolina and North Carolina’s Outer Banks as a strong Category 3 on Thursday, although shifts in the track are possible and storm impacts will expand great distances beyond where landfall occurs,” reported The Washington Post on Tuesday. Strike Fighter Wing Atlantic will divert aircraft to Scott Air Force Base, Ill.; Naval Air Station Pensacola, Fla.; Naval Air Station Key West, Fla.; and Fort Campbell, Ky.
Airborne Command and Control Logistics Wing will divert aircraft to Wright Patterson Air Force Base, Ohio, and Rickenbacker Air National Guard Base, Ohio. 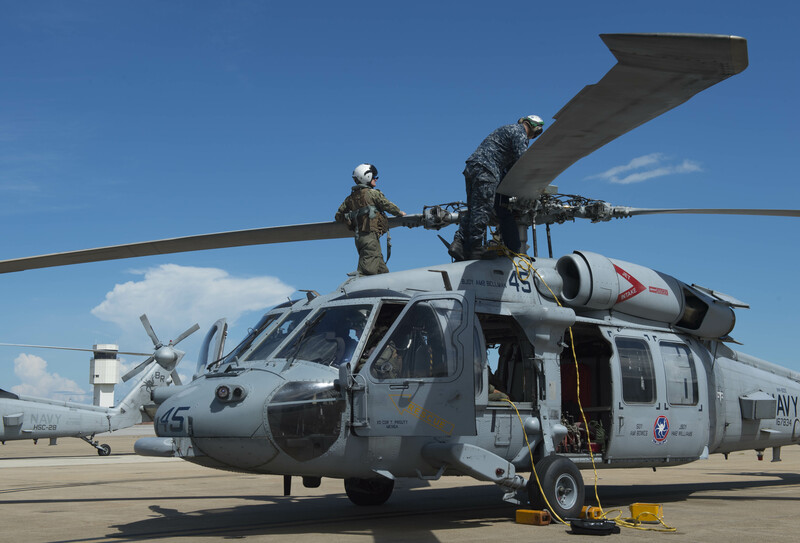 Helicopter Sea Combat Wing Atlantic will divert aircraft to Godman Army Airfield, Ala. Helicopter Maritime Strike Wing Atlantic will divert aircraft to Maxwell Air Force Base, Ala.
Patrol and Reconnaissance Wing 11 and Patrol Squadron (VP) 30 will divert aircraft to Selfridge Air National Guard Base, Mich.; and Wright Patterson Air Force Base, Ohio. Test and Evaluation Squadron (VX) 1 will divert aircraft to Yeager Field, W.V.